I’ve referred to this enough times and sent it to so many clients that I decided it’s time to post it here! 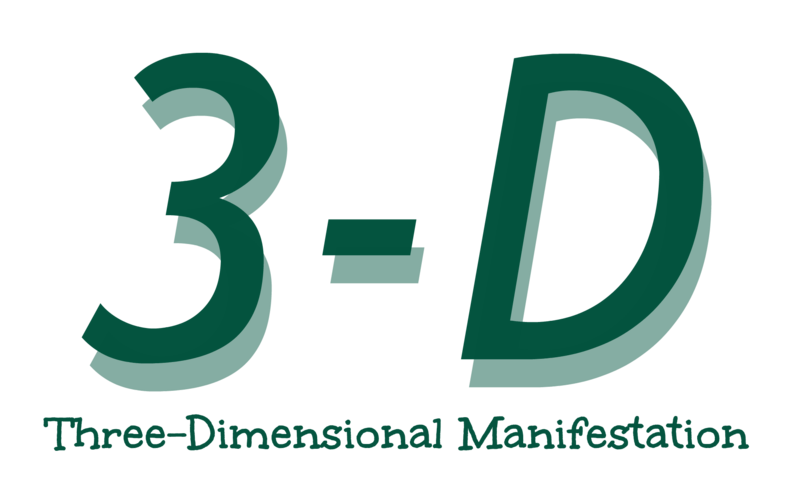 This is my manifestation tool that I call “3-D”. Please use it in good health and let me know how it goes for you! Oh, you know how to get what you want, don’t you? Study and get your education, work hard, and then harvest the fruits of your labors. Is that working in your life? Do your efforts consistently produce exactly what you want? Do you have the job and the relationships you really want? Do you look forward to every day, every moment? If there are any gaps, whether they are material or emotional or spiritual, I’m going to give you a simple formula to manifest what you want. This is a process I teach my clients on a more in-depth level, but even the basics will work for you. 1-D: Declare it perfect, just like it is. Whatever the dissatisfying situation, declare it perfect. For example, you find yourself wishing you could find a job you like better. When you make that wish, stop yourself and say, “No. It’s perfect, just like it is.” It’s a good idea to throw in a “thank you” too. I have created shifts by doing only this first step. There’s some kind of Universe Reverse Psychology that takes place with the “Declare it perfect” process. You know how sometimes it seems you get the opposite of what you were hoping for, like that new job? Well, saying the opposite of what you want can sometimes produce a profound effect. Try it. 2-D: Determine the feelings you want from the wish. Look back at your original wish-and keep in mind that it doesn’t have to be stated in the form of a wish. “I hate my job” is similar to the example I used in 1-D. So if it helps, turn your statement of dissatisfaction into a wish. Then determine what you want to feel, if you could get your wish. happy when I go to work. empowered by what I do every day. like I am making a difference. like I could enjoy the people around me. that I love my boss. that I love my job. Notice the way I stated each feeling in a positive way. I didn’t say any of them like, “I would feel like my boss fell off a cliff” or “I would feel like my office burned down.” It’s just about your feelings and how you want to feel. Write them down if that helps you to be clear with yourself. 3-D: Ask for the desire to do whatever will bring you those feelings. Read that again. Ask for the desire to do whatever will bring you those feelings. Let’s take it apart. “Ask” means whatever works for you-traditional prayer, asking your higher self, even setting an intention for meditation. But ask someone in some way. “Desire” is the same thing as “idea” or “motivation”. You know how hard it is to stick to a diet? And why? Most people blame willpower, or the lack thereof. But willpower has nothing to do with it. If you simply want to do something, it becomes very easy. “Whatever” is the action that will bring you those feelings. You want to leave it completely open, because you may not know what that action is. Sure, you know about getting your education and getting a job and working hard so you can play hard. But what if you just “had an idea” or “felt motivated” to do something that would bring those feelings? In the case of wanting a job you like better, what if it turned out that you could have those feelings at the job you have now? But you did something that brought you those good feelings you determined you wanted in 2-D. What if you simply “had an idea” to get counseling, read a book, or have a conversation with your boss–and that action made all the difference? I’ll give you a real-life example of how this worked for me: I wanted to lose weight. I know all those “hows” of losing weight, simply eat less and move more, right? Well, I didn’t want to, and I didn’t know which kind of exercise would work best for me, plus I didn’t want to eat less! So I declared it perfect: perfect body, perfect health, just like it was. Then I thought about all the feelings I wanted from losing weight: to feel thinner, prettier, healthier, sexier; to feel like I was buying smaller sizes of clothes; to feel attractive; etc. And then I asked for the desire to do whatever would bring me those feelings. And then I went about my business. Well, lo and behold, a few days later, I felt like going for a walk. I had the desire, idea, or motivation to do so. I put on my walking shoes and headed out the door. It was almost without thinking, like it wasn’t even me! Six weeks later, I was walking almost every day for about 35 minutes, and I noticed a smaller number on the scale. I thought about what I had been eating-was it possible I had cut back on breads and starches and added more salads and vegetables? I didn’t even know for sure. There was no willpower involved. There was simply a motivation that I was hardly aware of. And I lost 15 pounds in just a few months. Try 3-D on your job, your marriage, your love life, your weight, anything that you lack or want to improve. And then let me know how well it worked for you!